The 2026 Winter Olympics will be held, somewhere. That’s about the only thing we can say for certain, six months before the International Olympic Committee is due to announce who the host city will be. One potential candidate, Calgary, took itself out of the running last month with a public plebiscite in which residents decisively voted against the city’s $5.1 billion Olympics plan. Another, Stockholm, saw a new city government declare in October that it would not abide by the IOC’s demand that local governments promise to fill all funding holes for any Games. A third, a joint bid by the Italian cities of Milan and Cortina, is struggling forward despite a vow by the Italian government that “we won’t provide one euro” for Olympic costs. And beyond those lies the abyss. This is not the first time that the International Olympic Committee has found its store of host city bidders running thin—in fact, it’s becoming a bit of a biennial tradition. In 2015, the bidding for the 2022 Winter Games almost ground to a halt when a steady stream of cities backed out one after another, leaving the IOC to choose between Beijing and Almaty, Kazakhstan. (The IOC went with Beijing, not because of any distaste for torture, but because it feared that Almaty wouldn’t actually be able to get a Games off the ground, whereas if nothing else Beijing is good at ruthless efficiency.) In 2017 the IOC made the unprecedented move of awarding two summer Olympics at once, handing out the 2024 Games to Paris and 2028 to Los Angeles in order to avoid the headache of soliciting bids again four years later. It wasn’t long ago that the IOC was on top of the world, second perhaps only to FIFA in its ability to strong-arm local governments into coughing up billions of dollars in exchange for the rights to host a quadrennial sports carnival. But somewhere, a sea change happened, and events in Calgary, Stockholm, and Italy are a sign that the Olympic bidding wars may never be the same again. The result has been, if not quite a Humble IOC, at least one that has reined in its demands somewhat, no longer seeking a welcome mat of new velodromes and natatoriums in any would-be host city, but instead talking up “sustainable” Games that make use of existing facilities, leaving only footprints and taking only tourist money for hideous throw pillows. “It’s fair to say that they are doing a lot more talking about the need for lower cost bids, and the need for reform,” says Chris Dempsey, who led the successful charge to pull Boston’s bid for the 2024 Olympics, and later co-authored (with our old pal Andrew Zimbalist) the book No Boston Olympics. “But I don’t see a lot of fundamental change.” The bidding process remains designed to reward cities that commit to the biggest promises, he notes, which is a recipe for construction bloat. Still, as Livingstone points out, the most recent bids have seen some remarkable turnabouts. In Cortina, for example, the city wanted to use the Olympics as an excuse to renovate the sliding track it used for bobsled, luge, and skeleton when it hosted the 1956 Games. 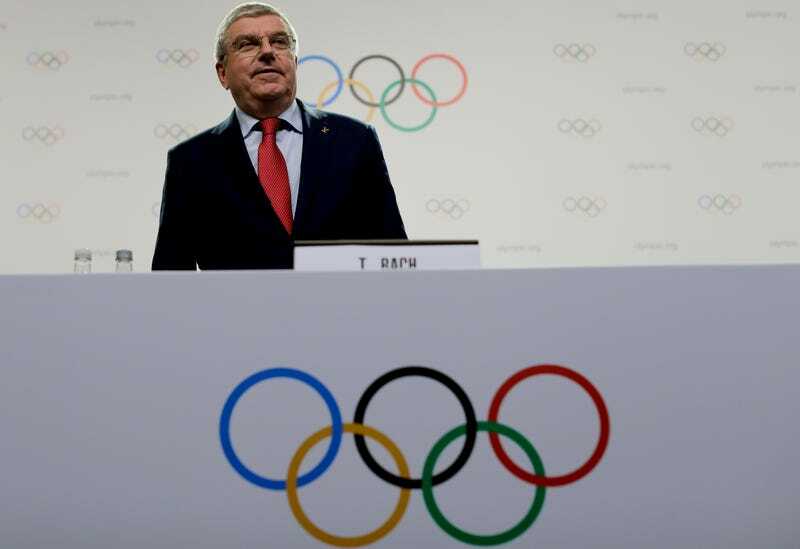 The IOC replied that the city should instead consider existing sliding tracks across the border in Austria or Switzerland that would require less work. Here we get into the complicated politics of the Olympics, because it’s not just the IOC that can have ulterior motives at work in seeking a site. Local elected officials often look to the Games as not just a source of tourist dollars and attention on the world stage, but also as a way to unlock subsidies from other levels of government—Calgary Mayor Naheed Nenshi as much as said that he was less excited about the Olympics coming to his town than the federal cash that was promised to come with them—and as a means of carrying out long-desired urban renewal projects: If you want to demolish a low-income neighborhood, needing the room for Olympic facilities can be a convenient pretext. Of course, even if the IOC is newly wary of the bad optics of white elephants, that doesn’t mean that it has changed its core principle, which is that we’re going to hold these games, but if something goes wrong and costs spiral out of control, we’re not going to be on the hook. It is a reasonable fear, because when you look at the history of Olympic costs, “spiraling out of control” is pretty much the only flavor they come in. The best study of the true price of the Games thus far was conducted by researchers at Oxford University in 2016, and it tells many very unhappy tales: The average summer Olympics from 1960 through 2016 required $5.2 billion (in 2015 dollars) in construction, the average winter Games $3.1 billion; this includes cost overruns that averaged an incredible 156 percent, meaning that whatever quote your city gives for an expected Olympic price tag, you should feel free to multiply that by 2.5. And though the study expressed hope for the future, noting that the 2016 Rio Games were projected for a mere 51 percent cost overrun—still bad, but at least an improvement—the 2020 Tokyo Olympics have since headed back in the wrong direction, with overruns now at 310 percent and counting. It’s not just stadiums that bloat the public’s Olympic bill: new road, rail, airport, and hotel infrastructure, the Oxford study noted, “often cost more than the Games themselves.” Security alone now typically costs more than $1 billion, thanks to the requirements of hosting more than 10,000 athletes and up to half a million fans for an event that has already proven a popular terror target. Thanks to all these known unknowns on the cost ledger, the IOC has traditionally required prospective host cities to supply a blank check to backstop any overruns. But with local governments increasingly balking at providing that guarantee—it’s what deep-sixed the Calgary bid with voters, and is a stumbling block for both Stockholm and Milan-Cortina—this could lead to a standoff in the near future, perhaps as soon as the January 11 deadline for cities to submit their official bid books. This may feel like a trivial matter: Even if the IOC agrees to accept an Olympic bid with no formal cost overrun guarantees, it’s beyond unlikely that any city would face an oncoming Olympics and say, “Hmm, ran out of money, guess we won’t bother assigning any cops.” But with the Olympics—as with the World Cup, and as with sports teams playing off cities against each other in relocation threat gambits — the sports industry has always relied on a fundamental imbalance of power. There are lots of cities competing, but only a handful of brass rings to go around. This could at least be the very beginnings of a shift to more European and North American cities, at least, pushing back against unlimited cost guarantees, leaving the IOC having to decide whether to temper its demands or face a future where the Games are increasingly held in third-world kleptocracies. “In the mind of the average taxpayer, the Olympics is synonymous with ballooning costs,” says Livingstone. And that’s not likely to change anytime soon: After Tokyo’s $30 billion-and-counting 2020 Games, next in line is Beijing, which is building a multi-billion-dollar high-speed rail line, among other things, in anticipation of the 2022 Winter Games. The Paris summer games could provide a test of the IOC’s newfound claim to parsimony—but that’s still six years off, and there are three more Olympics to dole out by then. Jan. 11 could provide our first hint of whether the IOC will get to continue business as usual, or if its reign of unlimited power is coming to an end, not with a bang but with a series of voter referendums.